In this audio article I offer tips for having a stress free Thanksgiving. Enjoy the holiday and live with “passionate purpose”! Our home is not only a place for rest, rejuvenation and celebrations, it is a place where many of us may create a business. Keeping your home reasonably tidy, decluttered and peaceful lays out the canvas for dreams to be born. If your full-time or part-time job is a that of a homemaker you are blessed with the opportunity to create a restful environment which encourages creativity. 1) You will be more likely to purse your side passion. Clutter and untidy spaces may make us and others feel bogged down. That there isn’t enough time to pursue other goals. One thing that Marla Cilley of Flylady.net teaches is that once you clear your clutter you may possibly find your purpose or passion. Though your purpose may be to live the role of a homemaker as taught in Titus 2, there may be other goals you have for your life. Perhaps you’ve wanted to design classy Victorian steampunk clothing and sell them on Etsy. Or you may have wanted to dedicate more time as a volunteer at the Rescue Mission. Maybe you would like to offer your home as a heaven for hospitality, inviting guests over for lunch. Search your heart and reflect on the dreams of your youth to give you inspiration. 2) Your husband may work on his dream. If you do your best to make your home clutter-free, tidy and peaceful your spouse may feel encouraged to work on his dream. When he comes home from his day job, ideally he would be greeted with a clean and welcoming home. This fosters not only an atmosphere of rest, it may spark creativity. A chaotic home and hostile home environment will make those who live with you feel uncomfortable. It’s best to approach interaction with family in a professional manner so you can maintain decorum when interacting with loved ones. It’s more challenging when doing this at home, yet it is the noble thing to do. It is an act of discipline and love. This will aid in preserving your relationships for the long-term and build your reputation. Think of your legacy. How do you want to be remembered? 3) Your children can find their art supplies and you can use them too! Rather than having art tools scattered about the house, gather them and place in drawers or labeled bins specifically for creating art. Your children can locate art supplies when they are organized, not hidden behind clutter. For most of my life I couldn’t understand why an adult would want to make crafts when it could cost the same to buy a similar item new. Then it occurred to me that it is the process of creation which is an act of celebration. When you make fall or winter themed DIY crafts you are getting into the spirit of the Holiday season, spreading the joy with your family. You may even discover that you want to go beyond simple crafts, making products that you sell online or at a fair. 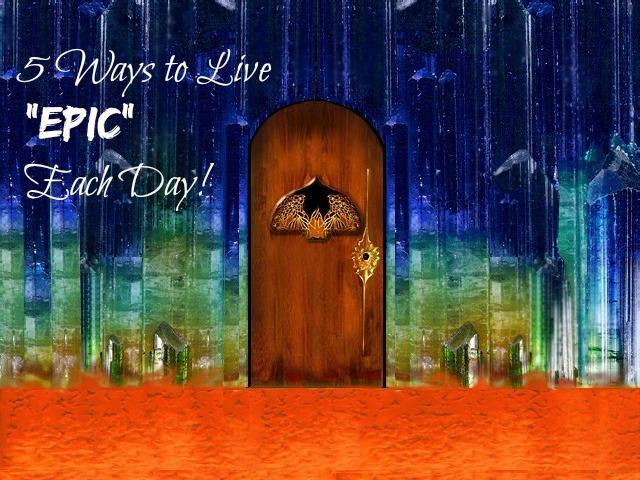 5 Ways to Live “Epic” Each Day! Every day we have a choice to live life to the full or halfway. If we allow circumstances to dictate the kind of lifestyle we choose our “Epic” and awesome days will be far fewer. Step#1 Keep your eye on your core life purpose or purposes. Race car drivers must keep their eye on the road, and not the hazard to get to their destination. Throughout the day you may have unexpected tasks, disappointments, or experience hurt feelings. Don’t let these events pull you out of the game. Step#2 Don’t let societies standards of greatness limit your epicness! For some, wealth represents the value you offer society. This believe is limiting and inaccurate as it does not measure the impact a person can make on others lives where there is no payment. Those who volunteer, servants in monasteries, missionaries, and homemakers (a.k.a stay at home moms or stay at home wives) all do noble work yet are not paid for their vocation. You may also be the provider for your household as a garbage collector, janitor, or plumber which may not be glamorous work yet the work is noble. If you are working toward your core purpose each moment of your life has meaning. We are captains of our ship and must steer it according to our map. Some of us toss the map thinking it will hold us back from creativity. It is actually the opposite. Products, paintings and inventions get completed upon the execution of a plan. Take time each day to handle necessary domestic tasks so that you can enjoy your creative work. Step#4 Look for the magic in each moment. Make a point to find as many golden moments as you can throughout the day. Start with the sunrise, then your morning coffee or tea, your daily exercise, the birds that you may see out of your window, your flavorful breakfast, and so on. Write down something that you are grateful for each day in your journal, which you can pass down to your loved ones. Step#5 Tap into unlimited creativity. Who provides this unlimited source? God. We are made in the image of God who created the Earth and the Heavens. It is not Satan, Lucifer, nor ourselves that is the source of art and creativity. You do not need to alter your mind with debilitating drugs to awaken your mind. Be alert and awake, so that you can not only complete your creation, you can ship it! Create one new digital art piece. Below is my most recent art piece. 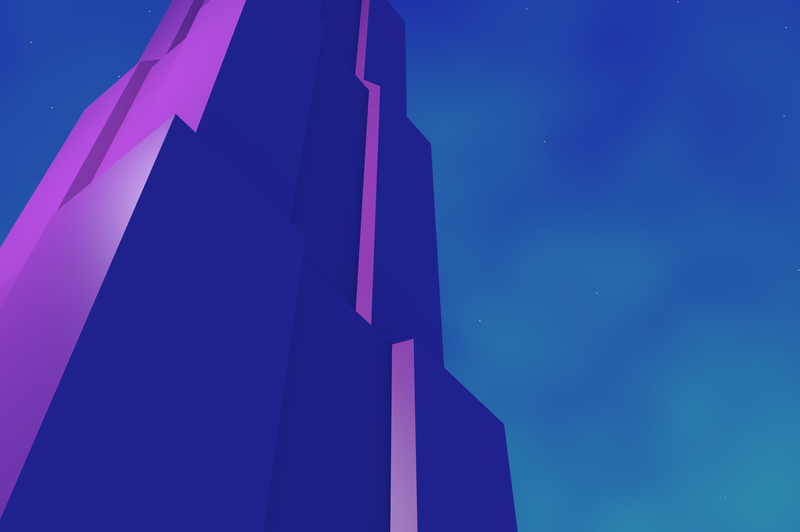 I created the futuristic building using 3D Blender. This image was also used as my backdrop on LinkedIn. Release one new informative “casual style” Living with Passionate Purpose YouTube video per week. Record samples of my voice singing eeh’s, ooh’s, and aah’s in all 12 keys. Edit, modify and export for use in future recordings. Write one blog post per week for this Blog: Living with Passionate Purpose. One of which should be monthly goals, as I “show my work” . Declutter for 15 minutes per day, paper clutter in 2 kitchen drawers. Big project. Deep clean 15 minutes per day. Using Flylady’s cleaning list. Have screen’s repaired at Do it Best. Listen to classical music for 30 minutes, Monday-Saturday. It helps to sharpen my tools as a musician revisiting the fundamentals of classic composition and arrangement. Keep in mind these are only the top goals, they are key projects which represent only a fraction of the work that is done. Good luck on your goals this month!